This example uses systune to generate smooth gain schedules for a three-loop autopilot. 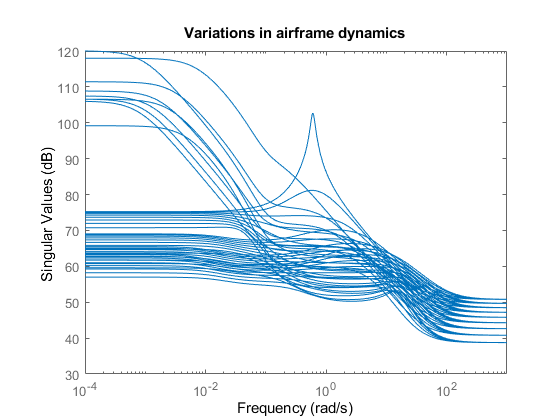 This example uses a three-degree-of-freedom model of the pitch axis dynamics of an airframe. The states are the Earth coordinates , the body coordinates , the pitch angle , and the pitch rate . 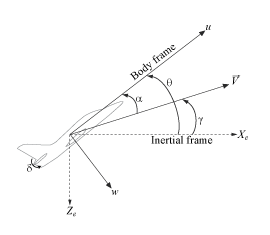 Figure 1 summarizes the relationship between the inertial and body frames, the flight path angle , the incidence angle , and the pitch angle . We use a classic three-loop autopilot structure to control the flight path angle . This autopilot adjusts the flight path by delivering adequate bursts of normal acceleration (acceleration along ). In turn, normal acceleration is produced by adjusting the elevator deflection to cause pitching and vary the amount of lift. The autopilot uses Proportional-Integral (PI) control in the pitch rate loop and proportional control in the and loops. 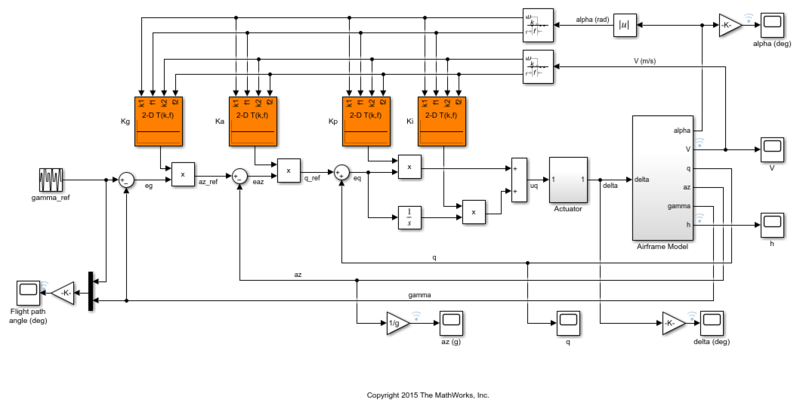 The closed-loop system (airframe and autopilot) are modeled in Simulink. The airframe dynamics are nonlinear and the aerodynamic forces and moments depend on speed and incidence . 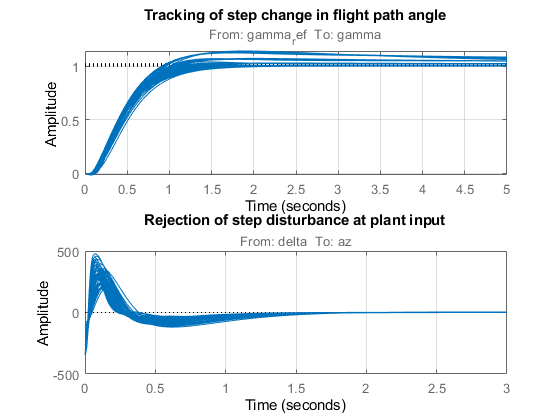 To obtain suitable performance throughout the flight envelope, the autopilot gains must be adjusted as a function of and to compensate for changes in plant dynamics. This adjustment process is called "gain scheduling" and are called the scheduling variables. In the Simulink model, gain schedules are implemented as look-up tables driven by measurements of and . Reconcile the gain values to provide smooth transition between operating conditions. 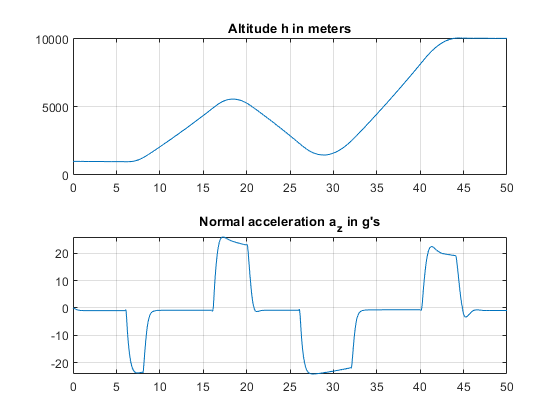 In this example, we combine Steps 2. and 3. by parameterizing the autopilot gains as first-order polynomials in and directly tuning the polynomial coefficients for the entire flight envelope. This approach eliminates Step 3. and guarantees smooth gain variations as a function of and . 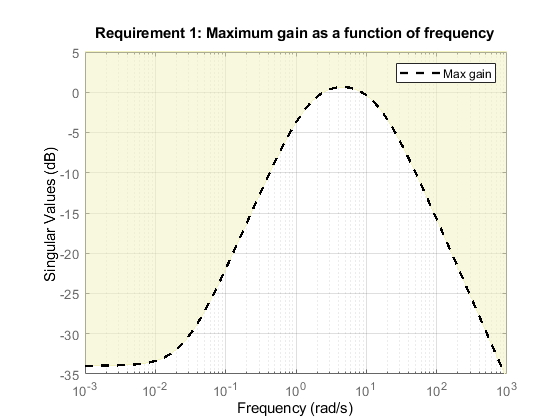 Moreover, the gain schedule coefficients can be automatically tuned with systune. For each flight condition , linearize the airframe dynamics at trim (zero normal acceleration and pitching moment). This requires computing the elevator deflection and pitch rate that result in steady and . 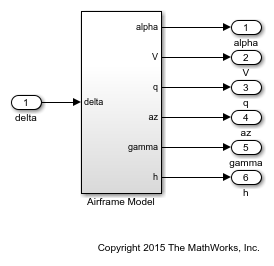 To do this, first isolate the airframe model in a separate Simulink model. Use operspec to specify the trim condition, use findop to compute the trim values of and , and linearize the airframe dynamics for the resulting operating point. See the "Trimming and Linearizing an Airframe" example in Simulink Control Design for details. Repeat these steps for the 45 flight conditions . This produces a 5-by-9 array of linearized plant models at the 45 flight conditions . The plant dynamics vary substantially across the flight envelope. Each surface is initialized to a constant gain using the tuning results for = 10 deg and = 1050 m/s (mid-range design). Next create an slTuner interface for tuning the gain surfaces. Use block substitution to replace the nonlinear plant model by the linearized models over the tuning grid. 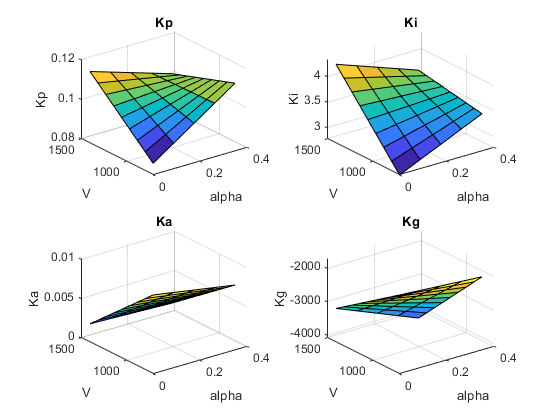 Use setBlockParam to associate the tunable gain surfaces Kp, Ki, Ka, Kg with the Interpolation blocks of the same name. 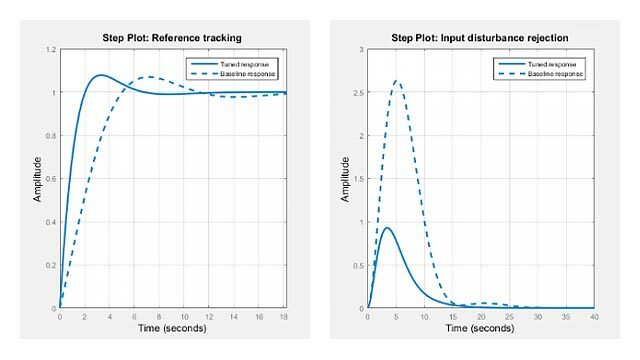 loop: Track the setpoint with a 1 second response time, less than 2% steady-state error, and less than 30% peak error. 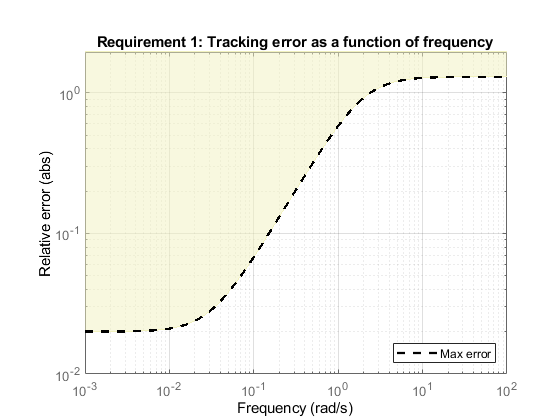 loop: Ensure good disturbance rejection at low frequency (to track acceleration demands) and past 10 rad/s (to be insensitive to measurement noise). loop: Ensure good disturbance rejection up to 10 rad/s. The disturbance is injected at the plant input delta. Using systune, tune the 16 gain surface coefficients to best meet these performance requirements at all 45 flight conditions. The final value of the combined objective is close to 1, indicating that all requirements are nearly met. Visualize the resulting gain surfaces. First validate the tuned autopilot at the 45 flight conditions considered above. 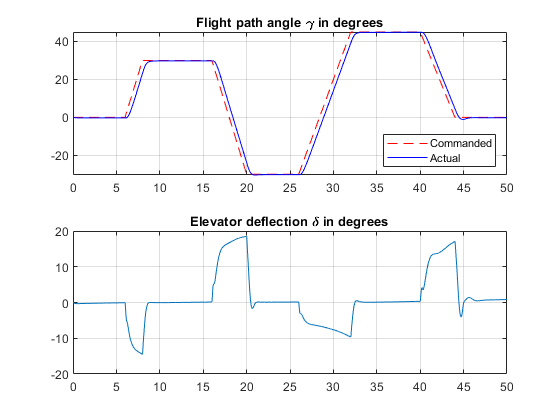 Plot the response to a step change in flight path angle and the response to a step disturbance in elevator deflection. The responses are satisfactory at all flight conditions. Next validate the autopilot against the nonlinear airframe model. 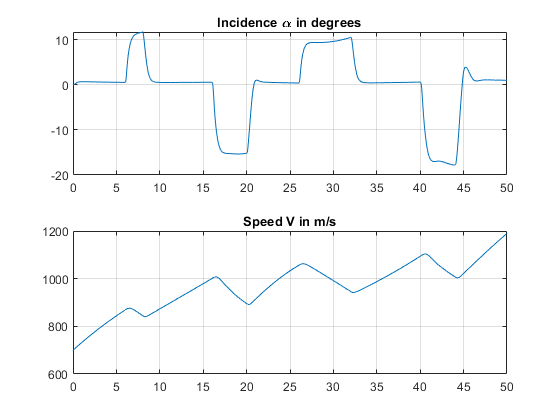 First use writeBlockValue to apply the tuning results to the Simulink model. This evaluates each gain surface formula at the breakpoints specified in the two Prelookup blocks and writes the result in the corresponding Interpolation block. Now simulate the autopilot performance for a maneuver that takes the airframe through a large portion of its flight envelope. The code below is equivalent to pressing the Play button in the Simulink model and inspecting the responses in the Scope blocks. Tracking of the flight path angle profile remains good throughout the maneuver. Note that the variations in incidence and speed cover most of the flight envelope considered here ([-20,20] degrees for and [700,1400] for ). And while the autopilot was tuned for a nominal altitude of 3000 m, it fares well for altitude changing from 1,000 to 10,000 m.
The nonlinear simulation results confirm that the gain-scheduled autopilot delivers consistently high performance throughout the flight envelope. 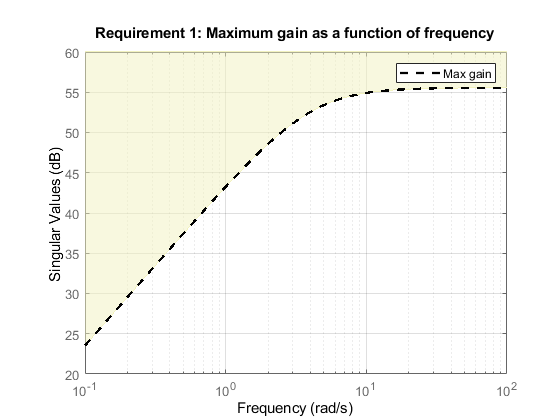 The "gain surface tuning" procedure provides simple explicit formulas for the gain dependence on the scheduling variables. Instead of using look-up tables, you can use these formulas directly for an more memory-efficient hardware implementation.